"Ryu Hayabusa is a ninja with a dark past from which he can never escape. This has nothing to do with the storylines of the Ninja Gaiden series that Ryu stars in, though. Ryu's tragic history is, in fact, his first NES outing, known simply as Ninja Gaiden. While the modern Gaiden on the Xbox and Playstation 3 might be a masterpiece, Ninja Gaiden on the NES and Wii Virtual Console will leave you feeling cheated and morbidly depressed. " Ryu Hayabusa is a ninja with a dark past from which he can never escape. This has nothing to do with the storylines of the Ninja Gaiden series that Ryu stars in, though. Ryu's tragic history is, in fact, his first NES outing, known simply as Ninja Gaiden. 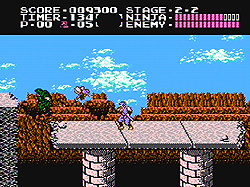 While the modern Gaiden on the Xbox and Playstation 3 might be a masterpiece, Ninja Gaiden on the NES and Wii Virtual Console will leave you feeling cheated and morbidly depressed. 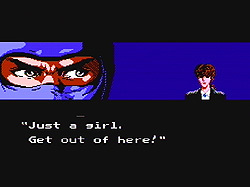 For an NES game, Ninja Gaiden has a surprising amount of story told through cinematics. Considering that the game was released in 1989, it's an impressive accomplishment to have this kind of approach to storytelling, but there's one critical problem: They're bad. The storyline is essentially some drivel about light and dark statues that imbue the wielder with great powers, and, expectedly, those statues fall into the hands of the enemy. This wouldn't be so bad if the plot was reduced to a mere line of text in the game, but it's drawn out through the movies thrown between each level that last up to five minutes each. It's painfully boring to sit through more than thirty seconds of the poorly written dialog, but luckily, this nonsense can be skipped with the press of a button. Unfortunately, then you have to play the game. When Ryu exchanges swords for words, the only victim is you. Ninja Gaiden is, quite simply, a blatant Castlevania rip-off. The core gameplay is a carbon copy, giving you a short-range melee weapon and a subweapon (usually a projectile), and the interface is so similar that you'd actually need to look at the two games side by side to see the difference. Gaiden's platforming and level progression feels identical for the most part aside from a few meager additions like the ability to jump from wall to wall, so it certainly won't win many points for originality. That's not necessarily a problem, but there is an issue when you factor in that Ninja Gaiden is a bad rip-off and feels shoddy in every aspect of its construction. Almost immediately, you'll be introduced to the game's biggest, most common annoyances. First, Ryu will bounce off an enemy every time he runs into one. That seems logical, except that this "bounce" actually means "launch," and these enemies are always placed on tiny platforms above bottomless pits. You will die from these situations. What happens if you attack enemies before you run into them? That would be a fantastic plan if the developers had been so kind as to include proper collision detection. Ryu will inexplicably be unable to fell his enemies far too often, instead choosing to have his sword fly through the enemy without dealing any damage. That's not all, though -- you get to fall into that pit. Again. So after you really get your plan of attack together, and the game functions well enough to allow you to kill the enemy that you hit, what happens? The other thing the game loves to do is have enemies respawn almost immediately, even if they're right in front of you. The developers didn't even try to mask this horrid attempt at making the game more challenging. The game progresses like this for the duration of the experience, with one caveat: it gets increasingly difficult as you progress. As you might expect by this point, you aren't being given an enjoyable challenge. Instead, the developers found as many frustrating, asinine gameplay elements as possible, and threw them into the mix. More difficult platforming, more enemies, and more unfair deaths are all that await you as you get farther into the game. A challenge isn't a bad thing, but here, you're never given a fighting chance. Getting knocked into pits repeatedly, being stuck on walls as you get attacked relentlessly by randomly appearing enemies -- this wasn't fun in 1989 and it's downright insulting now. The game's enemies are also particularly lame. While the standard thug, ninja, and army stereotypes make appearances, Ryu also finds himself attacked by cheetahs, bats, and multiple types of birds far too often to be considered normal. It's unclear what kind of egregious act Ryu committed to make the animal kindom despise him so, but the game becomes almost comical when you're swarmed by animals. Don't worry; it becomes frustrating again once they kill you in the most degrading fashion possible. Then again, even with sword in hand, Ryu still makes you suffer. The level design isn't particularly good, either. None of the environments stand out as being original or interesting. The actual layouts are similarly bland, and apart from giving you the occasional section where you have to use Ryu's wall jumping ability, there's absolutely nothing here that wasn't accomplished years before Gaiden's release. Adding further to the frustration is the checkpoint system in the game, which forces you to start from either the beginning of mid-point of a stage every time you fall in a pit or die at a boss. Had the game offered you more reasonable checkpoints that didn't force you to traverse the same areas over and over, the game would have been less frustrating (though still not particularly fun), but instead, the developers decided that annoyance was the best option here as well. Still, Ninja Gaiden isn't completely worthless. It does let you play as a ninja, which is always an interesting concept, and the wall-jumping mechanic is somewhat innovative considering the game's age. The problem is that the game's good qualities are all aspects that were only impressive when the game was released over 15 years ago. Now, there's little left that proves to be compelling, enjoyable, or anything but obnoxious. Gaiden has been rereleased on Nintendo's Virtual Console for a mere $5, and some will inevitably be tempted to buy the game while being blinded by nostalgia. Unfortunately for those poor souls, the game has not aged well even the slightest bit. With superior ninja fare like Shinobi III priced only a few dollars higher, there's little reason to even consider Gaiden. While Ryu Hayabusa will be remembered for his utterly fantastic recent games, Ninja Gaiden on the NES is a relic that needs to be forgotten. Namco’s mistakes have been remedied: fewer exploits, the removal of the somewhat pointless Soul Charge technique and slightly slower gameplay – seemingly small changes, but ones that nonetheless make for a smoother, more refined combat system. If you enjoyed this Ninja Gaiden review, you're encouraged to discuss it with the author and with other members of the site's community. If you don't already have an HonestGamers account, you can sign up for one in a snap. Thank you for reading! None of the material contained within this site may be reproduced in any conceivable fashion without permission from the author(s) of said material. This site is not sponsored or endorsed by Nintendo, Sega, Sony, Microsoft, or any other such party. Ninja Gaiden is a registered trademark of its copyright holder. This site makes no claim to Ninja Gaiden, its characters, screenshots, artwork, music, or any intellectual property contained within. Opinions expressed on this site do not necessarily represent the opinion of site staff or sponsors. Staff and freelance reviews are typically written based on time spent with a retail review copy or review key for the game that is provided by its publisher.